Would you pay more attention to an influential person in your field that you trust and respect, or to an ad from a brand that you may or may not have bought a product from? I bet it’s not the ad! Consumers tend to trust an influencer more than an advertisement. Companies are increasingly realizing the importance of influencer marketing and are using it to extend their brand reach and bring in more customers. Influencer marketing can drive great results for your business, but only if you can find truly relevant influencers. In this post, we take a look at how you can find and engage with real influencers using GroupHigh as an example tool when you’re doing blog outreach. The easiest way to explain how you can use a tool such as GroupHigh is through a practical example. 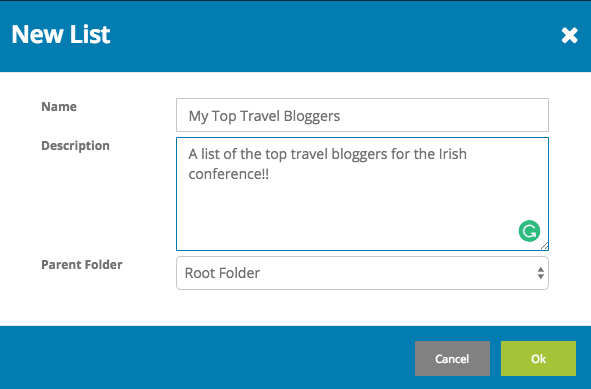 I’ve been working with a local tourism board recently to identify a group of influential travel bloggers and invite them to come to Ireland for a travel blogging event. I used GroupHigh to find them. In the example below, we are looking for top-level influencers, not micro influencers. This means we’re looking for a smaller group of people who have a large online presence, as opposed to a large group of people who have less influence (e.g. micro influencers). You can still use GroupHigh to identify micro influencers by following a very similar process to the one below. Note: Towards the end of this post, we also talk about how you can build your own influencer network which includes both top-level influencers and micro influencers. Following are the steps you need to take to find the group of relevant influencers, as well as what you need to do when you find them! Since you are now in influencer marketing(!) you’ll probably want to create multiple influencer lists to segment influencers by campaign or by any other criteria. When you create your list in GroupHigh it will store all the influencer details for this particular campaign. a). 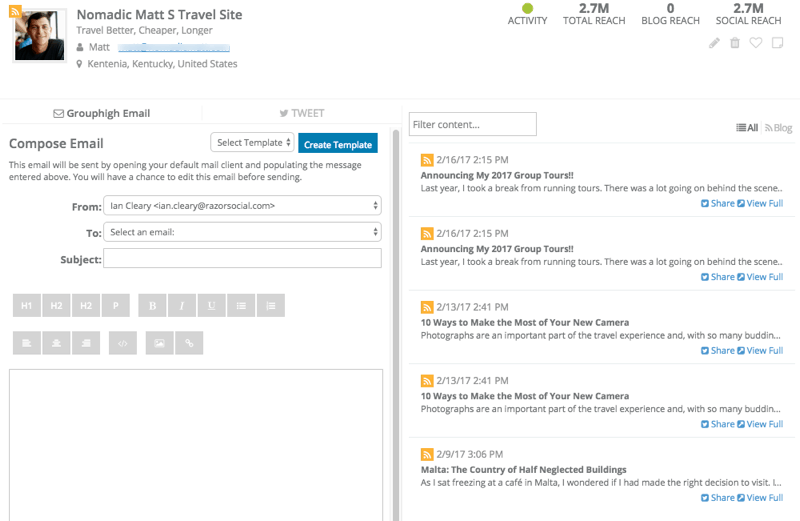 Using a tool such as GroupHigh to identify relevant influencers. b). Adding the people you already know to your list. c). Adding the people you find while browsing the web. GroupHigh will help you determine whether or not these people are real influencers. d). Add groups of people you find on lists. In our case, we’re looking for travel bloggers and there are lists of the top x travel bloggers on the web. You want an easy way to add these to your GroupHigh list so you can validate them all. GroupHigh provides a bookmark you can use to add individual blogs to your list, as well as a Chrome extension to add groups of bloggers found in lists (e.g. adding 50 at one time from a list of the top 50). The key to getting the best possible results when searching for influencers is determining the right keywords to use for search. List out the relevant keywords and try some test searches to see if the tool starts returning the most relevant information. For example, we tried ‘travel blogger’ and ‘travel writers.’ These search terms returned the best results for us. You can now build your list by searching GroupHigh and using the bookmark, the chrome extension, or just a list of blogs you have in a file. The key thing to think about is what helps ensure that the people you find are influential. When I’m searching through a list I’m thinking of domain authority, social authority, and relevance. Domain authority – There’s a company called Moz that ranks websites on a 1 – 100 scale, predicting how well a website will rank on search engines. The higher the number, the more authoritative a website is. So having a very low number (e.g. 20) means that a blogger’s content is not getting a lot of links and that they probably have very little traffic. Social authority – This is the authority a blogger has on social media. Someone may not have good domain authority but may have a high social authority and vice versa. Social authority is not just about the number of fans and followers, you’ll need to dig a little bit deeper than this. Relevance – A travel blogger might have a great domain authority and social authority but they may focus on a travel niche that is not relevant. If that is the case, then they should score a lot lower. So, I quickly created a search in GroupHigh based on the keyword ‘travel bloggers’ with a domain authority greater than 50. 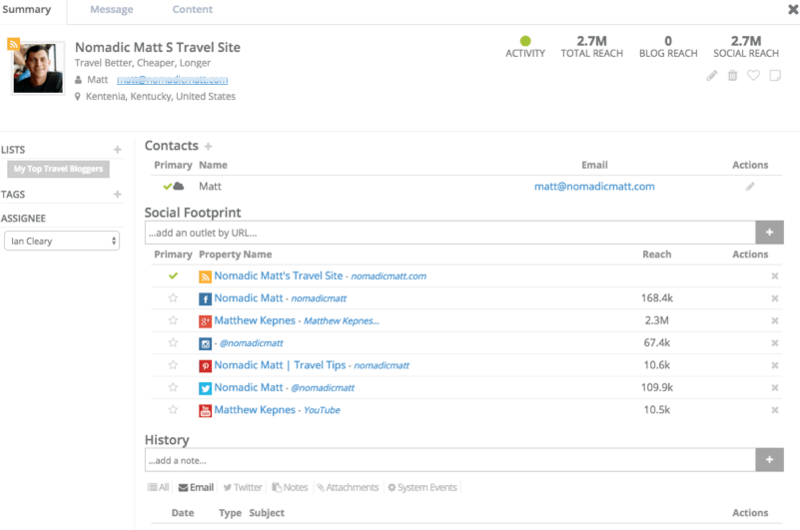 Within a couple of minutes of using GroupHigh, I was able to find travel bloggers that have a strong web presence! That’s just the first search I’ve done so I’m not going to add all these people to the list yet. I’ll want to use some of the many available filters, and also check their websites and social accounts to see if their content is good, if they get good engagement on their social accounts, etc. You don’t want a list of 1,000 influencers, you’re much better off with 100 great ones that you have researched well. 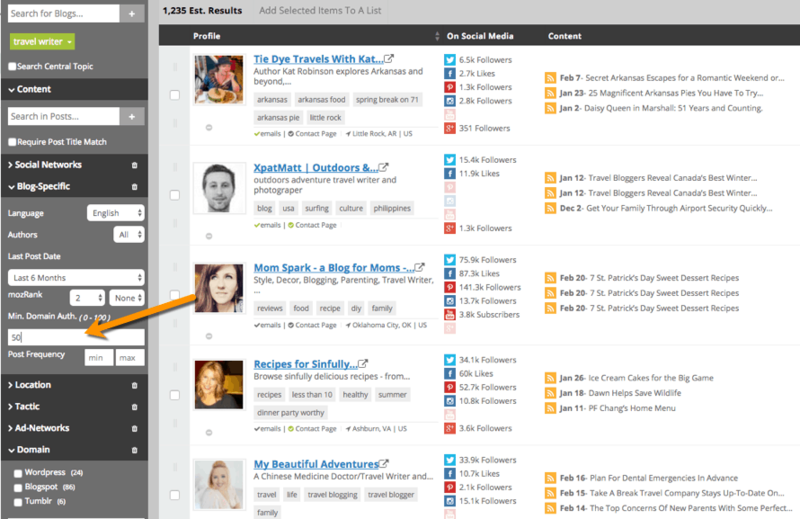 Search in posts – You might want to search posts (or titles of posts) for particular keywords. In my example, I want to find out if they wrote about or visited Ireland before. Social accounts – Your campaign may be suited to particular social media networks so you may want to find Pinterest influencers, Facebook influencers, etc. Language – You may want to find bloggers that write in specific languages. Authors – You can find single author or multi-author blogs. Tactics – Find blogs that publish sponsored posts, guest posts, etc. Ad networks – Find blogs that allow advertising on their site using Google AdSense or Doubleclick. If they display advertisements you’ll probably be able to advertise on their site also. Domain – Is it a WordPress blog, Blogspot or Tumblr. Include/exclude domains – You may want to exclude certain domains from your search. You’ve done some validation of your list already by going through different searches, analyzing websites, social profiles, etc. However, you should do a more detailed analysis on your final list before you begin your outreach. Participation – How interactive this person is online. 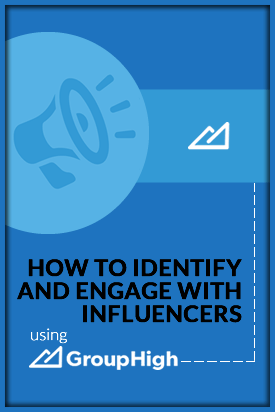 At this step, you’ll need to decide how you’re going to reach out to influencers. As I mentioned earlier, I like to have a smaller list of people and send personalized emails rather than generic ones. 70% of your email copy can be generic, but make an effort to customize the rest before you send it to an influencer. GroupHigh allows you to create templates, helping you save time on creating personalized emails. I also like to make some other form of contact with influencers before I reach out. For example, I might follow them on Twitter and share their content. If they are one of the top influencers, I’ll also subscribe to their newsletter because it’s always easier to get a response if you tell them that you value and support their work. Rather than jumping in and sending out batches of emails, take your time and use a phased approach for outreach. At the bottom of the screen, you can see there is a history of communication with Matt. GroupHigh records all emails and tweets that you exchange with an influencer. If you want to build a long-term relationship with an influencer it’s important to keep track of all communication. Why? Because they may not be interested in engaging with you right out of the gate, and knowing their initial response will help you follow up with appropriate email/tweet. In addition, if multiple people are involved in the outreach process you can assign different accounts to different people in GroupHigh. Your influencer outreach campaign will not go perfect and it will never be perfect. Perfect means 100% response rate from the best influencers in the world that drive the best results possible! a). Change your outreach approach – Maybe the email you’ve sent is not working. You’ll have to do a lot of testing before you get your outreach emails right. b). Revisit your influencers – Maybe the influencers you’re targeting are not the perfect match and you have to go back and find new ones to replace them. c). When you do get in contact with influencers they may recommend other influencers you could work with. This will change your influencer list. Once you’ve found your influencers, you’ll need to run the campaign and check results. I recommend a phased approach so you don’t engage all influencers at the same time. If you’re not getting results with the first group, at least you have a chance to adjust your strategy for the next group. You want to identify the influencers that are really driving results for your business and keep them on your list going forward. The real influencers are the ones that drive results! There are two types of influencers you can work with – the top-level influencers or ‘Ambassadors,’ and micro influencers who may have a smaller following but are still influential. You can use GroupHigh to identify and work with both categories of influencers, but you can also find influencers through your own network. Here’s an example from Nutiva, a company that sells organic food products. There’s an option on the company’s blog to join their VIP blogger network. Bloggers who join their network get special coupons and deals, free products, and other perks. This is a good way to add to the list of influencers you find through GroupHigh. Influencer marketing will see massive growth over the next few years. But to be successful at it, you’ll need to have the right skills and the tools to help you create effective influencer marketing campaigns. A tool such as GroupHigh is going to help save you a lot of time and money by streamlining all aspects of influencer marketing – from finding the right influencers, to creating and managing campaigns, to measuring results. How’s your brand connecting with influencers? I’d love to hear what tools you use too!